This is a painting of an open day at Bursledon Brickworks, Southampton UK during the early morning start-up of vintage traction engines. It is a heritage museum site, based in a old brickworks. 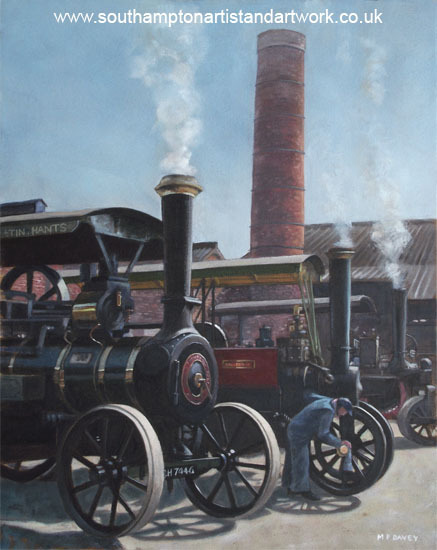 This display of traction engines takes place during the spring each year, and this artwork depicts the line up during April 2011. The engine in front is called 'Little Lucy', and is a Wallis Traction Engine. The tall brick chimney seen in the background is a local landmark, although it is shorter than it used to be when the brickworks was in operation. It was fun painting the shining brass, copper and the paintwork on the engines. The woman polishing part of an axle adds extra interest and scale to the scene. Getting the perspective correct in a scene like this is very important. It helps to sell the viewer of the painting the scale and weight of the machinery. Mechanical objects can not be cheated on when trying to ignore perspective, it has to be done right. The ariel perspective (colour fading in the distance) helps to sell the scene and create a smoky atmosphere.